Every carving is one of a kind, you will never find another one like it. It all begins with an idea and then is carefully executed by Richard Hamilton. Having the knowledge to carefully execute every carving with numerous tools and having an Artistic ability to truly deliver a wonderful work of Art, is why so many customers have trusted RLH Wood Sculptures to carve their Custom Order. 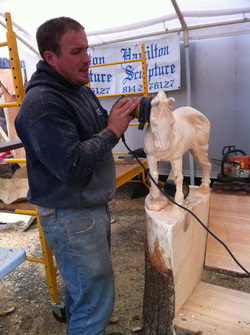 There are many steps in completing a carving. 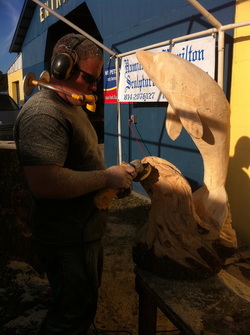 A chainsaw is used to rough out the carving. Detail is done with many tools including, angle grinders, orbitals, hand chisels, dremels, propane, etc. Finally treatment is applied. Sanding the Horses baby smooth after all detail work is complete. 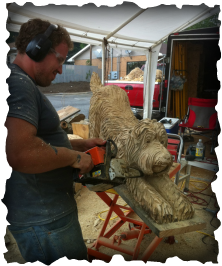 Carved at the Ridgway Chainsaw Carvers Rendezvous 2012. After being furred, Richard looks for the small details to add that will make it absolutely perfect. 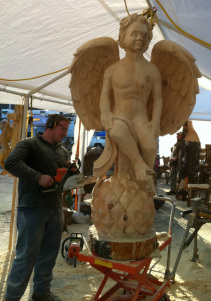 Seven Foot Cherub being carved at the Ridgway Rendezvous in Pennsylvania, February 2011. Roughed out with a chainsaw. Now being smoothed with an angle grinder.